Sears Weekly Ad Circular, valid April 21 – April 27, 2019. View Sears This Week Ad best deals, and sale on: Kenmore French Door Refrigerators – Stainless Steel; Keurig Brewing Systems; Kenmore Self-Cleaning Electric Range – Stainless Steel; Kenmore Elite Built-In Dishwashers – Stainless Steel; Kenmore Progressive Canister Vacuum Cleaner; Dyson V6 Motorhead Cordless Vacuum; Simmons Upholstery Editor Sofa; Stearns & Foster Signature Huddersfield Luxury Firm Twin Mattress; Everlast Men’s Jump Running Shoe; Bosch Built-In Dishwashers – Stainless Steel; NordicTrack Treadmills; Kenmore 12 Cup Programmable Coffee Maker; Roebuck & Co. Men’s Jeans; Samsung 55″ Class Curved 4K UHD LED Smart HDTV; Levi’s Relaxed Fit Jeans; Craftsman 19.2 Volt Drill Driver with 2 Lithium-Ion Batteries; Craftsman 155-Piece Mechanics Tool Set; KitchenAid Artisan Series 5 Quart Stand Mixer; Samsung 4K Curved LED Smart HDTVs; and much more. 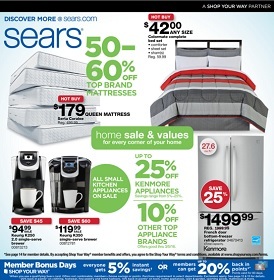 Find amazing deals, offers and prices in the latest Sears Weekly Sale Ad Circular.